Introduction of Citizen Volpone & his suite, at Paris. London, H.G.Bohn, 1851. Etching, 255 x 360mm. Coloured. Trimmed from larger sheet. Having supported the French Revolution, the English politician Charles James Fox withdrew from Parliament when France declared war on England in 1797. After the Peace of Amiens in 1802 he went to Paris to research a history of the 'Glorious Revolution' of 1688 and was invited to a levee at the Tuileries by Napoleon, a meeting satirised here. 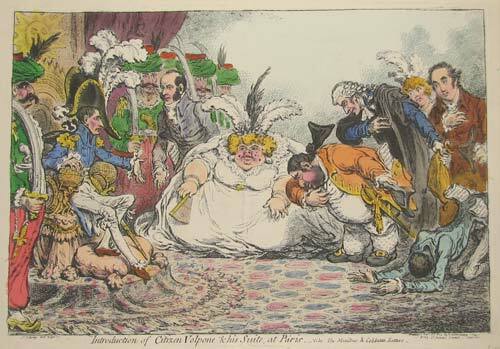 Unusually Napoleon is treated kindly: it is Fox, his wife and entourage who are being ridiculed. First published 1802.